The #edublogsclub prompt this week is to reflect on a challenge in education. We can no longer say we are preparing students for “the real world”, when what mean is ”the real world” that we grew up in, not recognizing current needs of today. This left me thinking about the challenge of digital identify in school. For many this debate quickly deteriorates into a battle between supposed traditional literacy and the more modern digital literacies. In this context, students having a blog and a member of a Facebook group is seen as a win. This problem is not discussed enough, especially what we mean by ‘real world’ and what we even mean by digital literacies? This includes where students set up their presence and the templated identities that are permitted in such spaces as Twitter and Facebook. Here then is my thinking on Couros’ leaving list. I wonder what it means to leave school with a PLN? Is it being in a Facebook group with hundreds of other people? Is it being on Twitter? Or is a PLN an attitude? A way of being? A verb? Surely, there is no point having a network if you do not maintain it. Maybe schools should provide a safe space in which students can develop these skills? Personally, I was lucky enough to be invited into a private forum by my friends when I was younger and was able to learn so much in this environment. Although I have read a lot about the potential Mastadon, I am unsure about the reality of managing such a space in school. Maybe the answer is developing a school school wide hashtag. My solution is to use a social media styled theme within WordPress. This then provides the possibility for students to have a level of ownership, control and support. Is it enough to leave school with a portfolio that has very little portability? A portfolio dependent on someone else’s space and upkeep? Although applications like Google Sites, Adobe Spark Page, Wix, Kidsblogs etc make it easy to create a site, this does not always mean that they are the best option. Students are often committed to platforms with limited means of moving. Audrey Watters talks about having a domain of one’s own, a space which you have some sort of control and influence. While Ian O’Byrne wonders about the prospect of this in schools. Whatever the specifics, we need to look past just giving students a space and think more ethically about the consequences of that space. It is for this reason that I think Edublogs is a positive platform in that it provides the balance between control and portability. Although something less complex like Jekyl maybe the ideal as the content can be easily adapted for any platform, WordPress is at least a start. I find it interesting when people list a product over the process. Join Twitter vs. becoming a connected educator. Create an About.Me page vs have a splash page, that space that links to all your other presences on the web. I created an About.me page years ago, feeling that was what I needed, but I have come to feel that I would prefer people start at my blog and go from there. I particularly like the way that Robert Schuetz maps out his identity on his blog. This then leaves me wondering why students cannot have aE page attached to their portfolio that acts as a ‘about.me’ page? If not, create a space somewhere else, just do it somewhere that you have control over. If students have their own domains, maybe they could create an ‘about’ sub-domain and install a one-page HTML site there? So those are my thoughts and I haven’t even touched on the IndieWeb or the potential of Tom Woodward’s API driven portfolio or the possibility that not everyone can share themselves online. I think that students should leave school with a sense of ownership over their (online) learning, the skills needed to connect and engage within networks, as well as an appreciation of the way the web works. What about you? What should students leave with? What real world are you creating? As always, comments welcome. 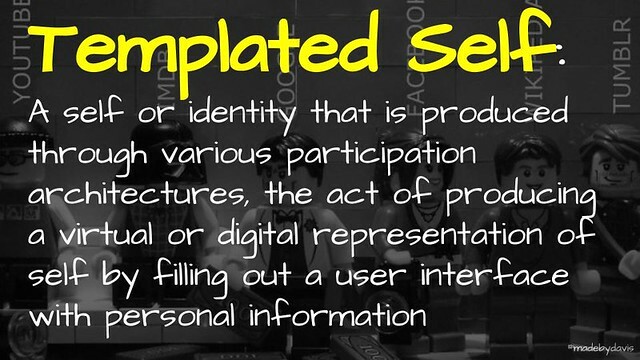 Supporting Digital Identities in School by Aaron Davis is licensed under a Creative Commons Attribution-ShareAlike 4.0 International License. Where as I agree with all your insights into how George Couros should have gone with verbiage instead of platforms/products, I can understand where he was going. Too often when I talk with teachers about processes, philosophies in instruction, etc. I get immediately asked questions like what tool does that or what product accomplishes it. It seems the ideas of concepts are being lost in the question of the “what” and not the “why”. Thanks Dan for commenting. I am wondering how we need to reframe the conversation to be more about the why or is it ok to simply focus on the what? It is hard to find a balance between the realities of teachers in the classroom vs. the ideals of educational technology. I left two super compressed comments as I read though your article and failed to really articulate my thinking. I appreciate your response to Couros, whose original post seemed to focused on \’personal branding\’ as a way of marketing the self which can close off possibilities for being an active citizen online. The idea that we should have our \’professional purposes\’ first in mind when we are online leads to the relative silence of many edtech / innovation gurus on political issues (Audrey Watters has written about this), which is an ironically inauthentic use of social media. I think your reference to the \’templated self\’ and the acknowledgement that not everyone can be online gives nuance to what is a complex issue. In particular, find Couros\’ suggestion that we need an about.me page simplistic when there are more interesting projects, like \’domain of one\’s own\’. The idea that kids need a \’PLN\’ strikes me as edspeak and out of touch – I don\’t think any other profession talks in these terms, though they certainly care about learning throughout their careers. Thank you for the comment and links to your own work. I think maybe we need more questions than answers. Maybe that would be a good place to start? Thanks for the spark, Aaron. The title of this post has grabbed my thought, interesting and clever. Having seen George present his thoughts on this, he is not tool centric, and only mentions spaces like About.me for their low barrier to entry, and the value they provide as transparent learning spaces. My original intent with digital V/R mapping, thank you Dave White, was to invite social interaction in the pathways of my digital footprints. What it has become is a reflection activity. Where is my education occurring? Why is it in these spaces? How is my map changing over time? Am I driving this, or is it drving me? To what degree are we responsible for our templates? The fact that I don’t know will fuel my next blog post. I do not think that ownership is either/or. I would prefer to consider it as an interrelated set of circumstances. I may not have complete autonomy, but surely I play a part within the puzzle? The challenge I think that we have is playing a bigger part. That I feel is the greater challenge. A thought provoking post. I think what is strong in the PLN idea is that is fluid. It can happen through current networks like Facebook, or school-controlled approaches like a handle or website. PLNs change over time but the skill of developing one I think, is the goal. The About.me page is static, and in this fast changing environment it might be more useful to consider the role of the online identity for personal and professional purposes. Many young people can not separate what happens online and the reflection of negativity or positivity on their actual identity. We see this though tragedies caused by online bullying. Perhaps the skill of discerning online content about the self is invaluable. Thanks for the link. How did the class blog progress? I agree of the dualism and fluidity and reflecting that in our choices. How do we teach self protection given the online/offline relationships for pln and image? I think that is such a wicked question Christina. Do we support ethical edtech or allow them to start where they are? The other question that this provokes for me is whether students always want us in such spaces? How could we bottle this to have our students analyzing, synthesizing, and then creating this way? It reminds me that collecting and curating can have consequences. I have found though that engaging more with the #IndieWeb ethos has led to me being more mindful of my actions. Your post reminded me of a challenge I see every time Couros posts about students having those three aspects of a digital identity: no matter how much we as educators may encourage this, ultimately it is up to the students to make it part of their lives. I have been blogging with my students for some years now, and when it is not a class requirement, they stop posting. I think part of this digital presence that we want students to establish – the ”residency,” as Robert Schuetz said in the recent blog post that led me here (http://www.rtschuetz.net/2016/02/mapping-our-pangea.html) – is not always happening where we suggest. I know my students have an online presence – but it’s on Instagram and Snapchat, not the blogsphere. Perhaps instead of dragging kids on vacation to where we think they should set up shop, we need to start following them to their preferred residences and help them turn those into sturdy, worthy places from which to venture out into the world.